Cpl. 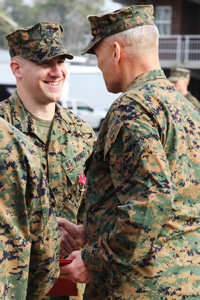 John D. Carney, who served as a fire team leader with 1st squad, 3rd platoon, Fox Company, 2nd Battalion, 2nd Marine Regiment, Regimental Combat Team 7 in Afghanistan, receives a Bronze Star Medal with Combat Distinguishing Device from Lt. Gen. John M. Paxton, commanding general, II Marine Expeditionary Force, during a ceremony aboard Marine Corps Base Camp Lejeune, Feb. 28, 2011. MARINE CORPS BASE CAMP LEJEUNE, N.C. (MCN - 2/28/2011) – Three Marines with Battalion Landing Team, 2nd Battalion, 2nd Marine Regiment, 22nd Marine Expeditionary Unit, received Bronze Star Medals with Combat Distinguishing Devices during a ceremony aboard Marine Corps Base Camp Lejeune, N.C., Feb. 28. Cpl. John D. Carney, a fire team leader, Capt. 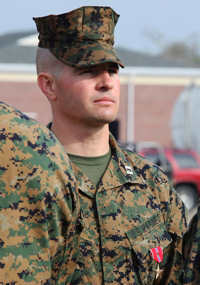 Brandon J. Gorman, Echo Company commander, and Sgt. Maj. William E. Heyob, battalion sergeant major, all assigned to the BLT, received awards from Lt. Gen. John M. Paxton, commanding general, II Marine Expeditionary Force, for their heroic actions while deployed to Afghanistan. Carney received his award for several actions, specifically for valor when his squad faced a Taliban ambush, Dec. 27, 2009. Pinned down in an open area by multiple Taliban machinegun positions, Carney lethally employed his M-203 grenade launcher, then led his fire team to engage the enemy. After receiving his award, Carney modestly said he didn't “deserve the Bronze Star,” but his leadership disagreed, saying his actions while deployed certainly merited the prestigious medal. Gorman, also personally “humbled” by his award, attributed his success to the courageous Marines of the battalion. He said the award was really for them to share. Gorman received his award for several achievements, specifically for actions, Nov. 24, 2009, while on patrol with his rapid action force near Hajji Zahir Village, Afghanistan. During the patrol, Gorman and his Marines received accurate and effective enemy machinegun fire. Despite the incoming rounds, Gorman assessed the situation, ordered a sniper team leader to employ 40mm high explosive grenades, oriented the squad on the enemy and ultimately disabled the enemy positions. Finally, Gorman “[disabled] the enemy with indirect fires and close air support,” enabling the Marines to push forward clearing the enemy positions. His actions resulted in multiple enemy casualties. Heyob was commended for his duties as battalion sergeant major, and specifically awarded for his actions, Jan. 12, 2010, in Garmsir District, Afghanistan. On this day, a violent riot erupted in the district, threatening the district police station and Governor's Compound. Heyob led a reinforcing effort, and inserted two vehicles into a crowd of more than 300 rioters. “Immediately, his vehicle came under heavy and effective small-arms fire and a volley of hundreds of projectiles thrown by rioters,” according to Heyob's award citation. Heyob, like Carney and Gorman, attributed his battalion's achievements to the loyal dedication of the Marines and sailors in the “Warlord” family. The Marines and sailors of the 22nd MEU are currently in the midst of a pre-deployment training program, which is a series of progressively complex exercise designed to train and test the MEU's ability to operate as a cohesive and effective Marine Air Ground Task Force. Capt. Brandon J. Gorman, who served as Echo Company commander, 2nd Battalion, 2nd Marine Regiment in Afghanistan, stands at attention after he received a Bronze Star Medal with Combat Distinguishing Device from Lt. Gen. John M. Paxton, commanding general, II Marine Expeditionary Force, during a ceremony aboard Marine Corps Base Camp Lejeune, Feb. 28, 2011. Sgt. 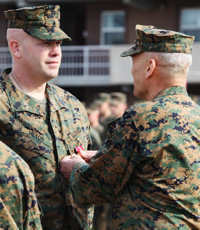 Maj. William E. Heyob, battalion sergeant major for Battalion Landing Team, 2nd Battalion, 2nd Marine Regiment, 22nd Marine Expeditionary Unit, receives a Bronze Star Medal with Combat Distinguishing Device from Lt. Gen. John M. Paxton, commanding general, II Marine Expeditionary Force, during a ceremony aboard Marine Corps Base Camp Lejeune, Feb. 28, 2011.